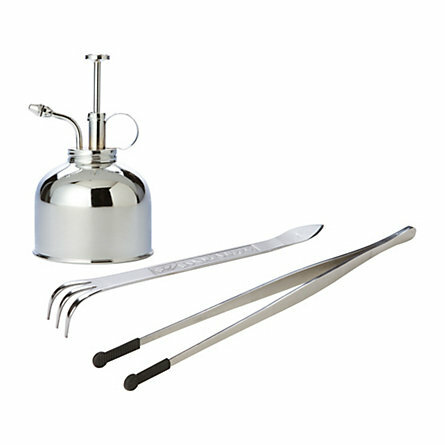 If your mother happens to love making terraria- perhaps next Mother's Day you can spring for this ultraposh set of nickel-plated brass tools from Terrain. They also have a ton of lovely terrarium vessels if you are willing to pay. In spite of the sheer madness of spending this much on items you could likely get at the drugstore - I will say a rake, a tweezer and a mister bottle are all must-have terrarium tools. The rake will help you settle soil and low-lying foliage. The tweezers are essential for adding and removing plants. And the mister is simply the best way to water your terrarium - hands down.